We partnered with local company ADK Packworks to bring you the most versatile grocery bag, backpack, and multi-functional tote that you have ever seen! If you are looking for an alternative option to our gift baskets or wooden Dakin Farm box, this nylon bag is a great option. It features an adjustable carry strap for use as a two handled tote, an over the shoulder bag or a backpack. The metal frame adds to its durability and it super easy to clean. Traveling? 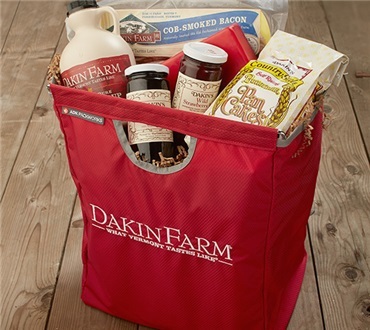 Keep our Dakin Farm meats and cheeses fresh longer with our removable cooler liner accessory. If you would like to order the Tote and the pictured food as a gift you can click here Dakin Farm North Woods Jumbo "
Bought this to fill up with all the various cheeses/spreads, crackers and summer sausage. Nice and sturdy -- will be used to tote the above as a "family" gift when we all get together at Christmas.